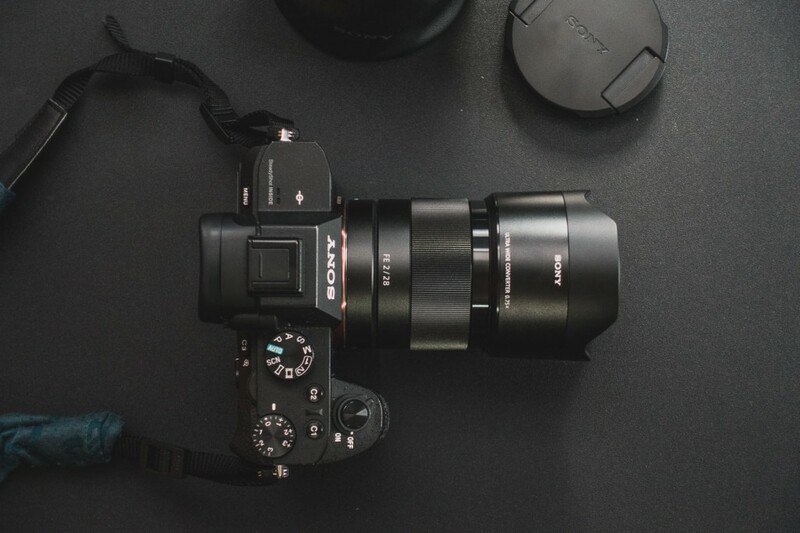 Sony is quickly rounding out the lens lineup for their a7 line of full frame mirrorless camera. The a7 cameras have been missing a dedicated a fast wide angle lens that’s native to the system and so the FE 28mm f/2 lens finally fills this gap. 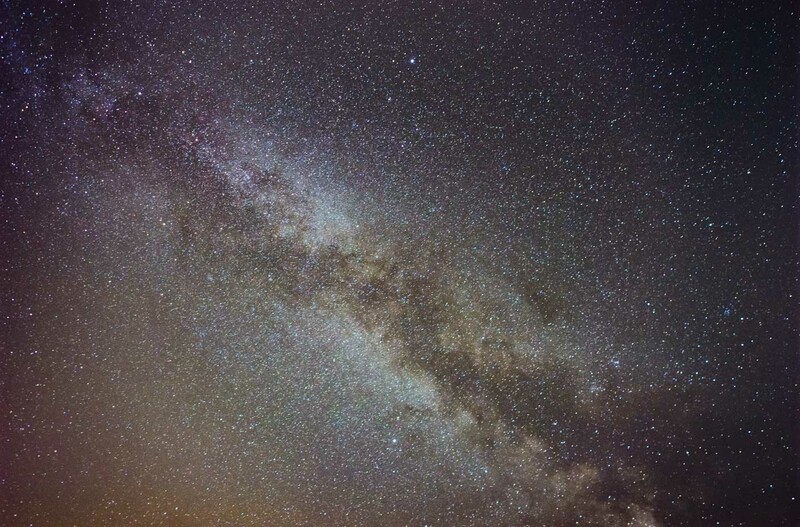 At Lonely Speck we absolutely love fast wide angle lenses for use with landscape astrophotography. 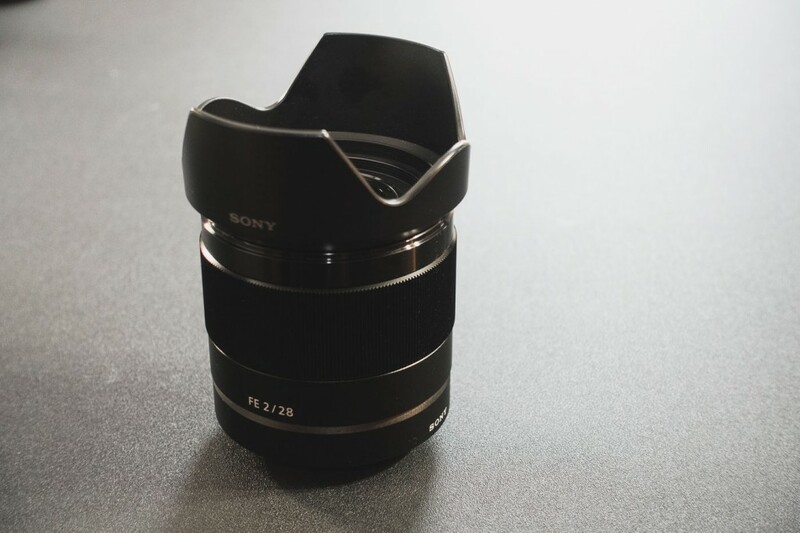 We’re especially excited for this lens since the only native full frame, wide angle lens options faster than f/4 are the Sony Zeiss 35mm f/2.8, the Sony Zeiss 35mm f/1.4, and the newly announced Zeiss Batis 25mm f/2, all of which are markedly more expensive than this FE 28mm f/2. It’s about time that the most affordable full-frame system gets a relatively affordable fast prime lens. Sony’s approach to this wide angle prime is a little bit different in that it’s a sort of “system lens.” Similar to the older APS-C Sony E 16mm f/2.8, Sony released the FE 28mm f/2 with two optional accessory conversion lens adapters. There’s the SEL075UWC which converts the lens to a super wide angle 21mm f/2.8. Second up is the much larger SEL057FEC which converts the lens into a ultra wide angle fisheye 16mm f/3.5 with a 180 degree field of view. 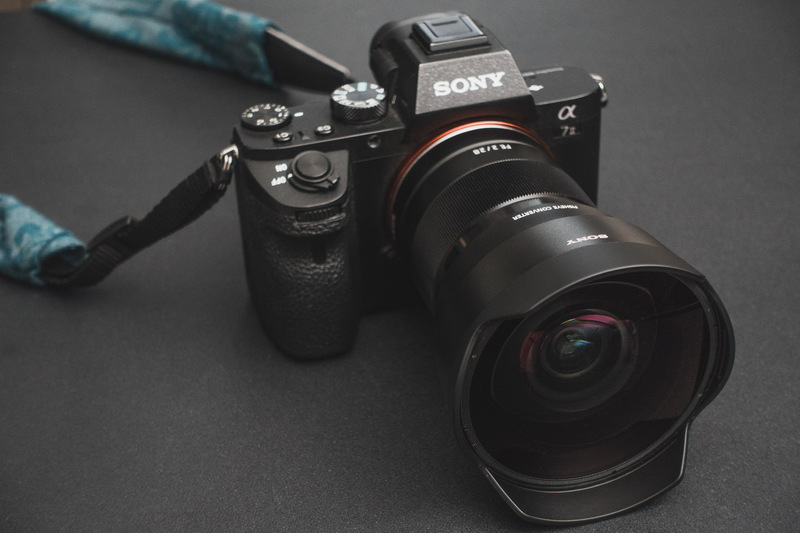 If the FE 28mm f/2 lens alone can hold up in image quality and performance, it should prove to be one of the best value lens options for the Sony a7 Series. The conversion adapters do add some versatility to the lens in terms of field of view but I’m skeptical of the design decision to offer these conversion lenses rather than dedicated 21mm and 16mm prime lenses. Usually add-on lens converters are never well regarded in the photography community but I’ll give them a serious try for this review. One of my primary reasons for writing this review was from the suggestion of our readers but I was also personally excited to see if this lens would offer me a smaller alternative to my much larger Rokinon 24mm f/1.4 (my astrophotography review). I still love the fast 24mm from Rokinon but it’s also very large and heavy for use on the camera I’m currently traveling with (the Sony a7II). I almost exclusively use the Rokinon for astrophotography but tend to leave it off my camera otherwise just because it’s so large and less fun to carry around. The FE 28mm f/2 is not as wide and not as fast as my 24mm Rokinon but the reduced size and autofocus seemed like worthy trades. I’d love to try out the newly announced Zeiss Batis 25mm f/2 for a lens that seems close in field of view to my Rokinon 24mm f/1.4, but that lens is priced much higher, putting it in a whole different price league when compared to the lowly Sony 28mm f/2. With its small size and autofocus, the 28mm f/2 is a lens I am more excited to leave on my camera for astrophotography and daytime landscapes and portraits alike. Let’s see if it lives up to the task of shooting the stars. 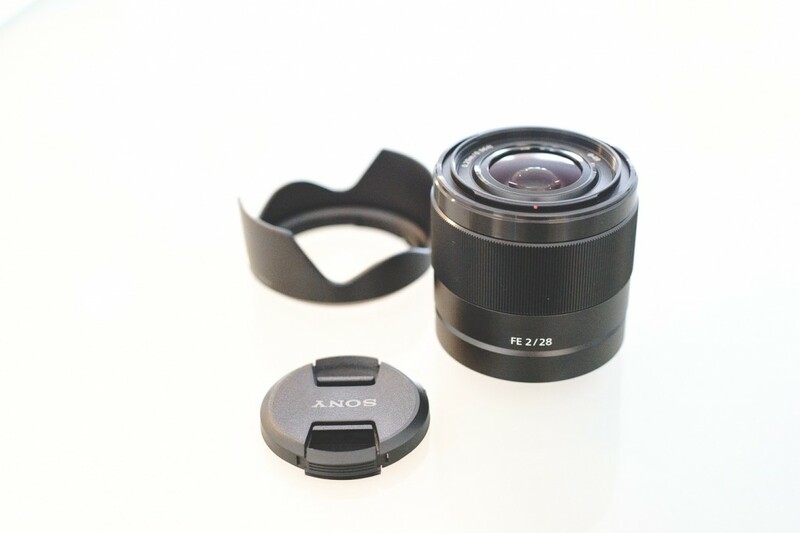 The Sony FE 28mm f/2 Lens is primarily targeted towards use on the a7 series of cameras but can be mounted to any Sony E-mount camera including the Sony a6000 and a5100. 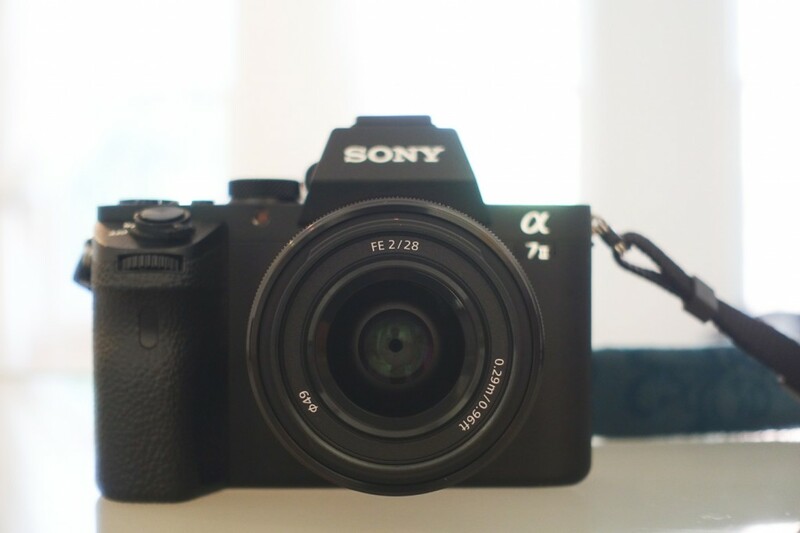 On the full frame a7 series of cameras, like the Sony a7II that I used for this review, the FE 28mm f/2 offers a moderately wide angle 75 degree field of view. If mounted on the APS-C E-Mount cameras like the a6000, the FE 28mm f/2 offers a standard field of view of 54 degrees. 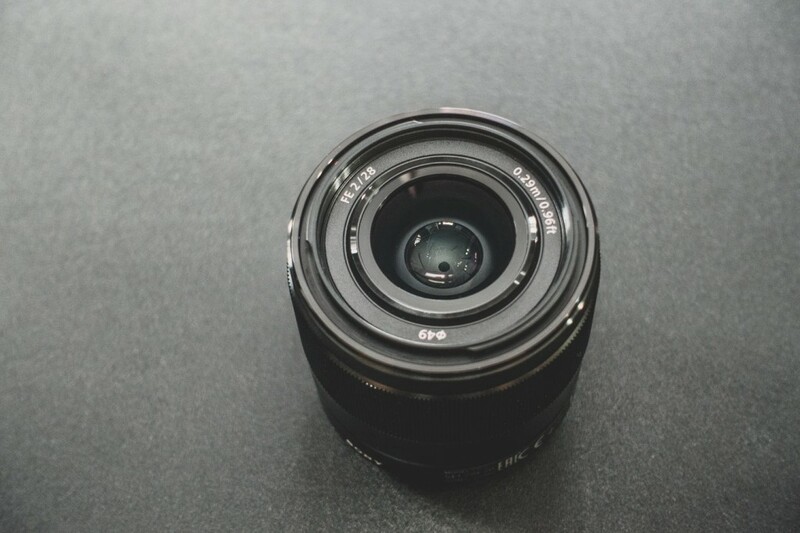 The FE 28mm f/2 is a small lens. 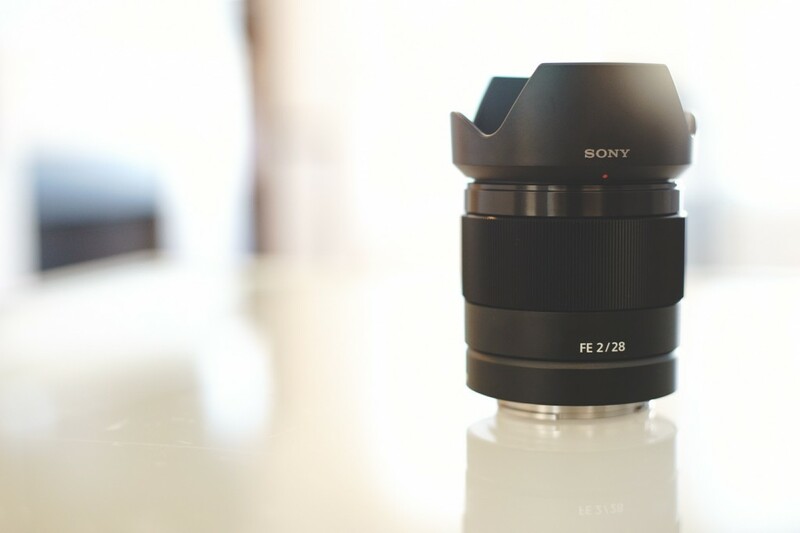 It’s the same diameter and only about 1 inch (2.5cm) longer than the smallest full frame E-mount lens, the Sony Zeiss 35mm f/2.8 (as shown below). At 7 ounces (200 grams), it’s also very lightweight so it doesn’t seem to change the handling of the camera at all. On the a7II, it feels nice and balanced. The lens seems to be made almost entirely out of metal, save for the front filter thread and bayonet where the hood attaches, which are plastic. It feels almost identical in build quality to the more expensive Sony Zeiss lenses. Side-by-side with the FE 35mm f/2.8 lens, they feel like they could have been made in the same factory. It shares the same matte black finish for most of the lens barrel and the same grooved metallic focusing ring. The only notable differences are in the final branding finishes of the lens: lack of embossed text and no Zeiss badge on the cheaper FE 28mm f/2. 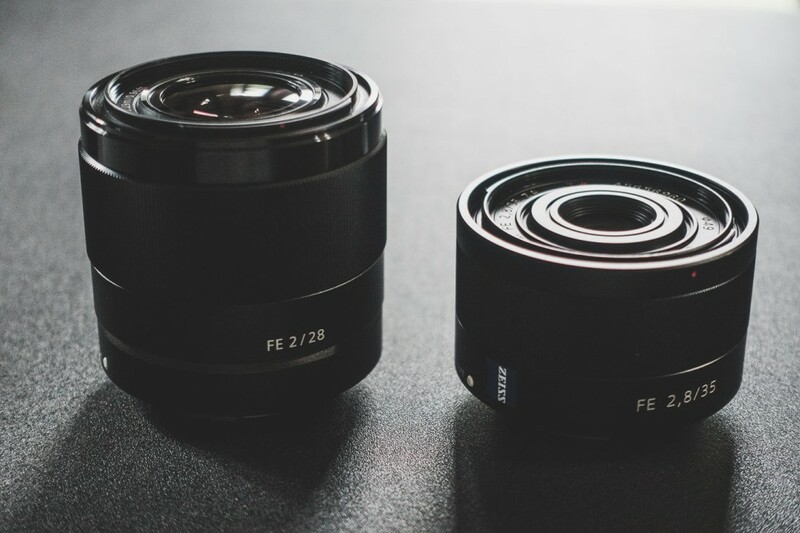 Compared to other fast full frame 28mm lenses for competing full frame systems, the FE 28mm f/2 is competitively priced. Although it’s 1/3 of a stop slower, it’s also a bit cheaper than Canon’s EF 28mm f/1.8 USM or Nikon’s 28mm f/1.8G while offering a smaller and lighter overall package. The all metallic design adds a more refined feel compared to the plastic Canon and Nikon lenses and the linear internal focusing system is significantly quieter than the Canon USM and Nikon wave motor focusing systems, both of which are already very quiet. Focusing on the FE 28mm f/2 is very fast and the manual focusing ring rotates smoothly and makes for decent manual focus acquisition. I’m still not a huge fan of Sony’s fly-by-wire manual focusing but it does make it easier to manual focus more precisely, albeit less quickly. The focusing system on the Sony FE 28mm f/2 is completely internal so there are no external moving parts and the lens does not change in length when racking focus. Other than the focusing ring, there are no other external controls on the lens. The aperture and autofocus/manual focus functions are all controlled electronically with the camera. I found the lens to focus very quickly on the Sony a7II in almost any lighting condition during normal shooting and finding infinity focus when manually focusing for astrophotography was easy enough with the a7II’s built in manual focus assist zoom function. Just center on a bright star and focus and the system automatically zooms in to show a magnified close up for finer focusing. I even found the electronic distance scale representation to be accurate if carefully used: the best infinity focus seemed to be upon the first instance that the scale indicates that it is focused at infinity. This lens fits the role of an ideal always-on-the-camera lens for me. It’s compact and light so there’s never any reason to take it off the camera. Its focal length is wide enough for medium field of view landscapes but not so wide that you’d avoid it for natural looking portraits. I’ve used a 28mm equivalent lens for astrophotography for a long time, originally with the Canon 28mm f/1.8 USM on the Canon EOS 6D (my full review) and then later with the Fujifilm X-E1 (my full review) and the Fujinon XF 18mm f/2R. 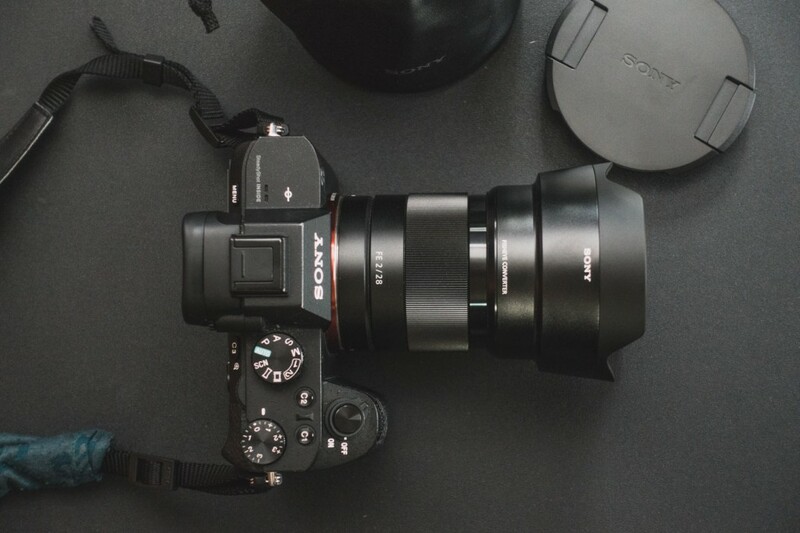 The Sony FE 28mm’s f/2 aperture is large enough for narrow depth of field control and low-light astrophotography shooting. 28mm has always been one of my favorite focal lengths for its versatility and the Sony FE 28mm f/2 seems to be a great example of one such lens. The lens features a small 49mm filter thread which is the same as the Sony Zeiss FE 35mm f/2.8 and the Sony Zeiss FE 55mm f/1.8. So between those three lenses, they can all share the same filter system, a sort of medium range trifecta for the Sony a7 series. The FE 28mm lens comes with a removable plastic petal lens hood that attaches via a typical bayonet on the front of the lens. It also has a standard pinch-style lens cap, just as you would expect. 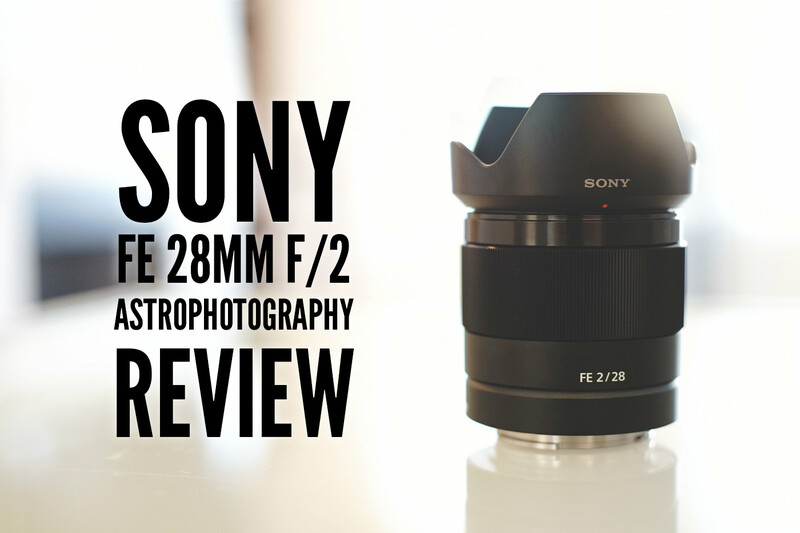 Overall, the Sony FE 28mm f/2 feels like a good value. It features good build quality, is light weight, focuses fast and silently, and is competitively priced with other fast full-frame 28mm lenses. Where things start to get less positive is when pairing the Sony FE 28mm f/2 with one of its two available conversion lenses. The SEL057FEC is a 0.57x fisheye conversion lens that converts the Sony FE 28mm f/2 lens into a 16mm f/3.5 fisheye. The SEL075UWC is a 0.75x conversion lens that changes it into a 21mm f/2.8 super wide angle. I was skeptical of Sony’s decision to offer these conversion lenses for their otherwise premium and enthusiast oriented compact mirrorless system, they just seem like a bit of a stop-gap design decision. Perhaps Sony realizes that they’re still behind the curve when it comes to ultra wide angle lens offerings (the only other native full frame option being the Sony Zeiss FE 16-35mm f/4 OSS), so they just decided to slap a couple of conversion lenses on their first affordable prime in order to hold us over until they can design some “real” lenses. Now these conversion lenses aren’t just some generic accessory. They’re purpose built for the FE 28mm f/2. 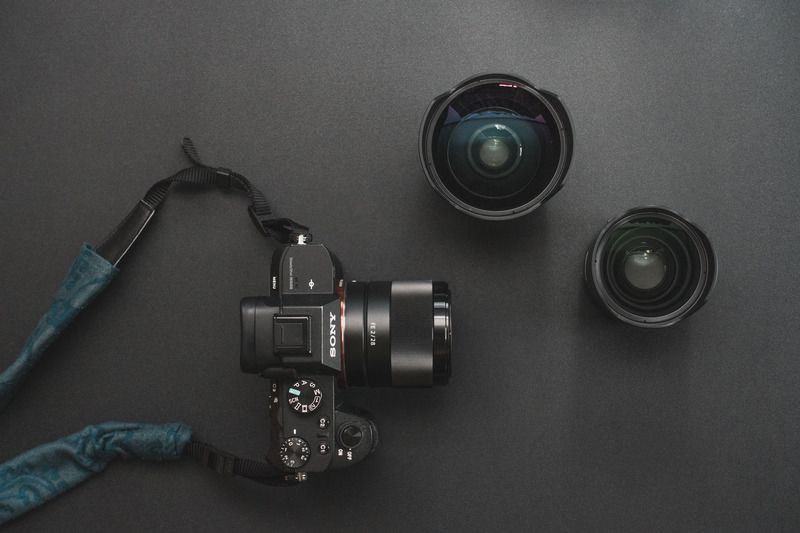 They do maintain infinity focus properly and communicate with the camera such that the proper aperture f/number and lens focal length conversion are recorded in the EXIF data. With the SEL075UWC attached, Adobe Lightroom reports the lens as a Sony FE 21mm f/2.8 while with the SEL057FEC attached, Lightroom reports the lens as a Sony FE 16mm f/3.5. The perks of these adapters, however, kind of stop there. Each conversion lens is heavy. Seriously heavy. The SEL075UWC weights 267 grams, 67 grams more than the lens it is mounting to and the SEL057FEC is a monstrous 418 grams, more than twice the weight of the bare FE 28mm f/2. With that much extra mass hanging out on the front of the lens, the camera feels noticeably front heavy. During my time with the lens and its conversion adapters, I typically found myself wishing the setup was lighter weight. Most other competing full frame fisheye lenses are lighter than what you get with the SEL057FEC and most other full frame 21mm f/2.8 lenses are much, much lighter than what you get with the SEL075UWC. The conversion lenses also do not feature filter threads so you lose the ability to use a filter. On the fisheye adapter it’s probably acceptable as very few fisheye lenses also allow you to mount filters but the problem also exists when using the SEL075UWC 21mm f/2.8 adapter, making it the only full frame 21mm f/2.8 lens that I know of that does not allow you to use a filter. Now I rarely used filters of any kind when shooting astrophotography, but I’d like my lenses to still allow for the option as I also enjoy shooting daytime long exposures and occasionally like to mount a graduated neutral density filter for sunset landscapes. The fixed petal hood on the conversion lenses also means they have a strange, thick lens cap that’s specific to the conversion lens. Again, for the fisheye adapter, it’s not a huge deal as most fisheye lenses have weird caps but I would prefer a generic filter thread cap on the 21mm adapter at least. Finally, the conversion lenses never seem to seat fully tight on the FE 28mm f/2. They mount securely enough that they won’t accidentally fall off, but they still have a little wobble on the mount, even when fully locked in place. While I’ll certainly give good marks to the FE 28mm f/2 lens for overall impressions, its accessory wide angle and fisheye conversion adapters seem out of place on an otherwise premium feeling compact system camera. My initial impressions of the conversion lenses generally indicates that photographers should avoid buying them. There are more compelling, lighter-weight, and less awkward ultra wide angle solutions for the a7 series. If you want some excellent ultra-wide angle and fisheye options for the a7 series, consider some of the third party or native alternatives. There’s the Rokinon 12mm f/2.8 fisheye, Sony Zeiss FE 16-35mm f/4 OSS, Voigtländer 15mm f/4.5 Heliar III (astrophotography review) and even the Sony E 10-18mm f/4 OSS which covers the full frame sensor if used between 12mm and 16mm. That said, I still put the SEL057FEC and SEL075UWC conversion adapters to the test. Let’s see how they performed at making astrophotos. The Sony FE 28mm f/2 is an optical surprise. From a standpoint of sharpness, bokeh quality and aberration performance, the lens is excellent. For astrophotography, the lens performed very well with the stars, even wide-open at f/2. It does have very minor signs of coma and astigmatism at the extreme corners at f/2 but the overall aberration size is very small so in practice the lens takes some very pleasing astrophotos with no distracting aberrations. Where the lens suffers the most is in distortion and vignetting. Both distortion and vignetting are relatively high. When recording in RAW, the lens has very pronounced barrel distortion. The distortion is easily corrected with the lens profile included in Adobe Lightroom CC but this also means that you’re losing a little bit of resolution. For the RAW preview or when shooting in RAW+JPEG and JPEG mode, the camera automatically corrects for the distortion and outputs a distortion free image, a feature I enjoy especially when trying to quickly transfer a shot directly from the camera to my smartphone so that I can do a quick share on my Instagram without worrying about the distortion affecting the image. I personally don’t usually care too much about vignetting but it should be noted that at f/2, the corners of the image will tend to be a little darker. The vignetting can be corrected automatically via the lens profile included in Adobe CC but technically the lens is still losing a little bit of its light gathering power to the vignetting. 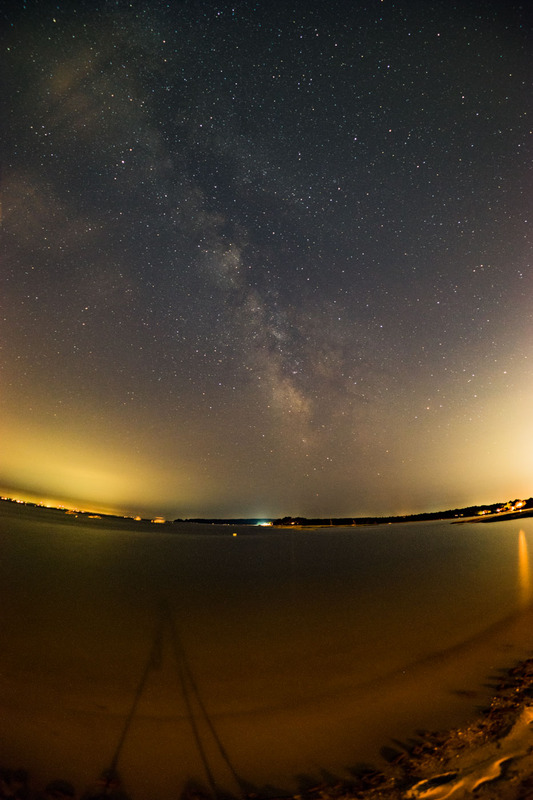 This trait is typical behavior for a fast wide angle lens but it can also make it more difficult in situations where you need to push the photos a lot in post processing, as in many of the light pollution ridden test images on this review. The vignetting improves by f/2.8. 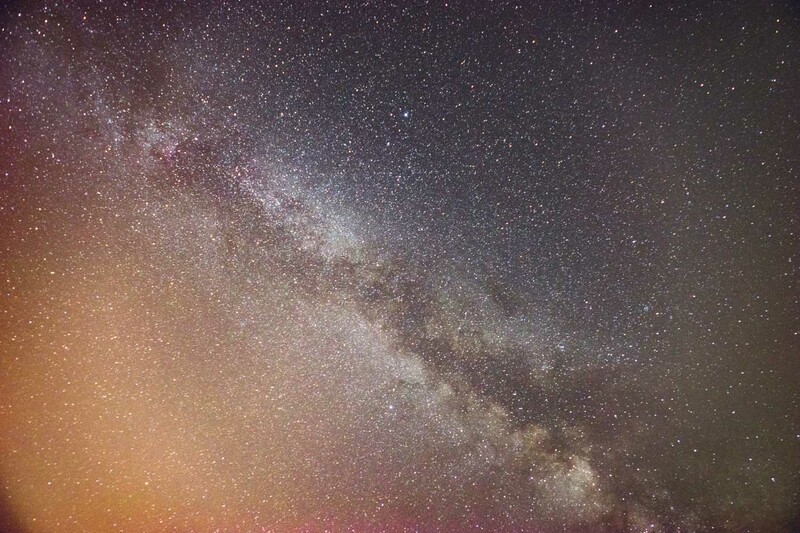 We ran the Sony FE 28mm f/2 lens through our newly developed aberration test to characterize the performance of the lens for use with astrophotography. It’s not perfect, but the lens performs very well, even at f/2. 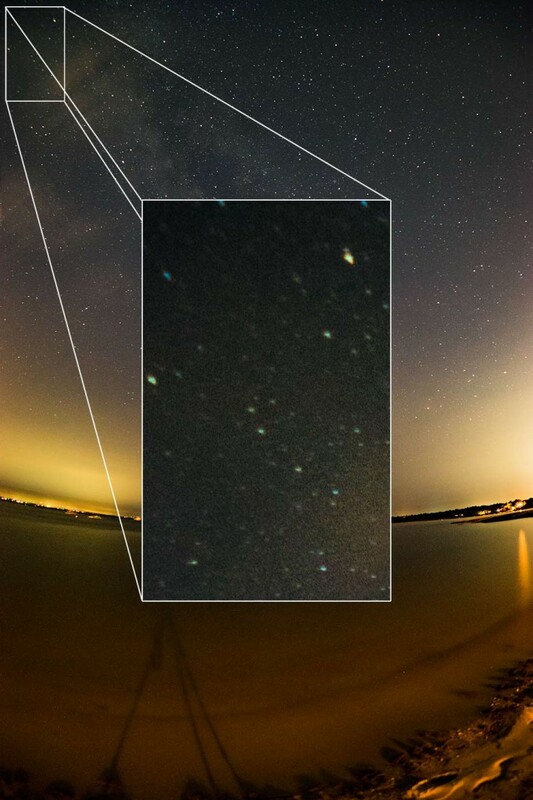 This is ultimately what we care about in any lens, especially for astrophotography. 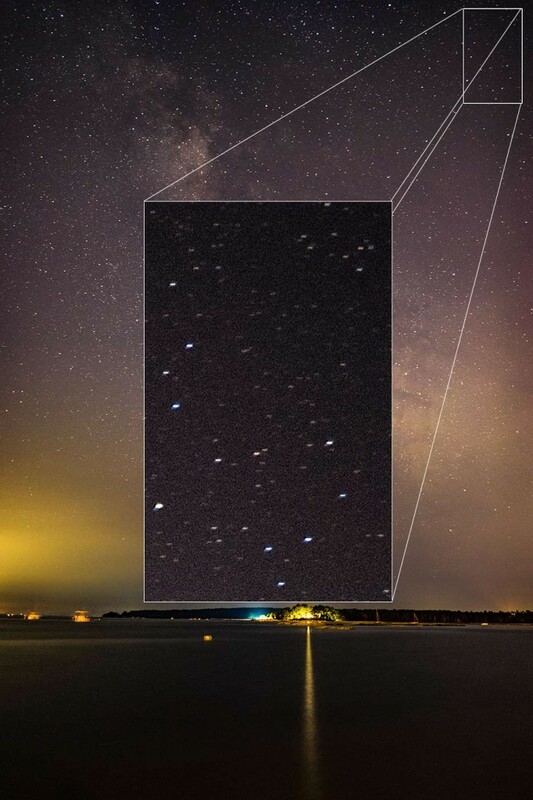 While there is still some minor signs of coma and astigmatism in the full frame corner of the image, the overall aberration size is small enough that, in practice, the lens should produce very nice astro images. Any signs of distracting aberration almost completely disappear when the Sony FE 28mm f/2 is stopped down one stop to f/2.8. For comparison to my favorite 24mm, the test shows that it nearly matches the capability of my Rokinon 24mm f/1.4 when stopped to f/2 which tends to be my most used aperture setting on that lens anyways. In my general use of the lens at night, it shows the typical behavior of a fast lens: wide open at f/2 it starts very sharp in the center will a little bit of sharpness decrease towards the corners. For most of my shots of the Milky Way made with the Sony FE 28mm f/2, I just left the lens wide open and it performed admirably. Stars stay looking like pinpoints across the field of view and I’m overall pretty happy with its performance at f/2. There should be absolutely no hesitation to use this lens at f/2. Of course, as with nearly every modern camera lens, sharpness increases as the lens is stopped down until about f/5.6 or f/8 where the maximum sharpness of the lens is achieved. From f/8 to f/22, the sharpness remains very good but gradually tapers off due to diffraction. Typical of all lenses, for the sharpest edge-to-edge results during the daytime, use the lens at about f/5.6-f/8. For astrophotography, the Sony FE 28mm f/2’s sweet-spot is thankfully wide-open at f/2. The bird like shape of the small aberration in the corners of the lens when at f/2 indicates that the lens has a very small amount of both coma and sagittal astigmatism, sometimes called sagittal coma flare. However, like I said before, the level of aberration is pretty small so in practice it’s not typically visible at normal viewing sizes and falls into what I would consider “excellent” performance. Luckily, the aberrations don’t seem to change too drastically when the SEL075UWC is attached. My test isn’t geared towards analyzing a fisheye lens so I don’t have any useful results to publish for the SEL057FEC. All told, I’m at least happy to see that the SEL075UWC conversion lens doesn’t suddenly create coma or astigmatism. It performed better than I anticipated really. One problem that did notice outside of this aberration test is that the conversion lenses seem to introduce some field curvature. When shooting wide open, the corners of the image seem to quickly shift slightly out of focus as you look nearest the edge of the image. 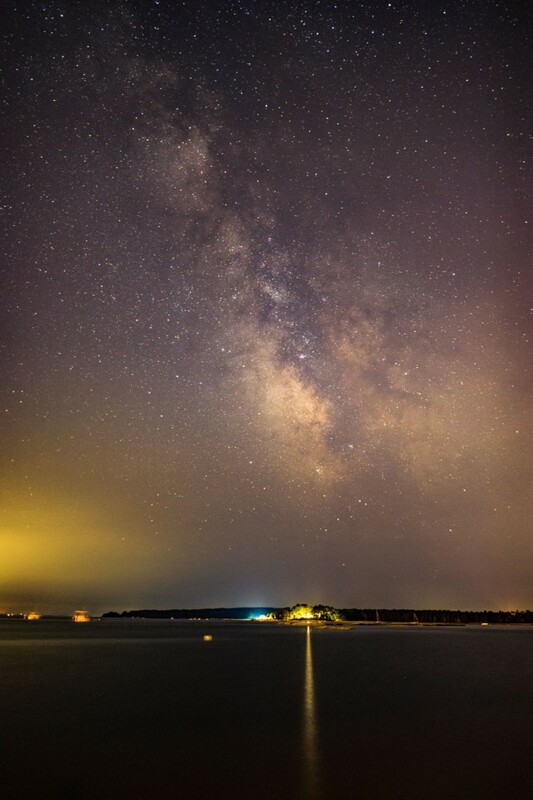 You can see the light pollution domes from the towns of Falmouth, MA to the left and Marion, MA to the right. The humidity was rather high on my night of shooting so that made it even more difficult to process these images from the sheer amount of dull orange glow from all of the street lamps. 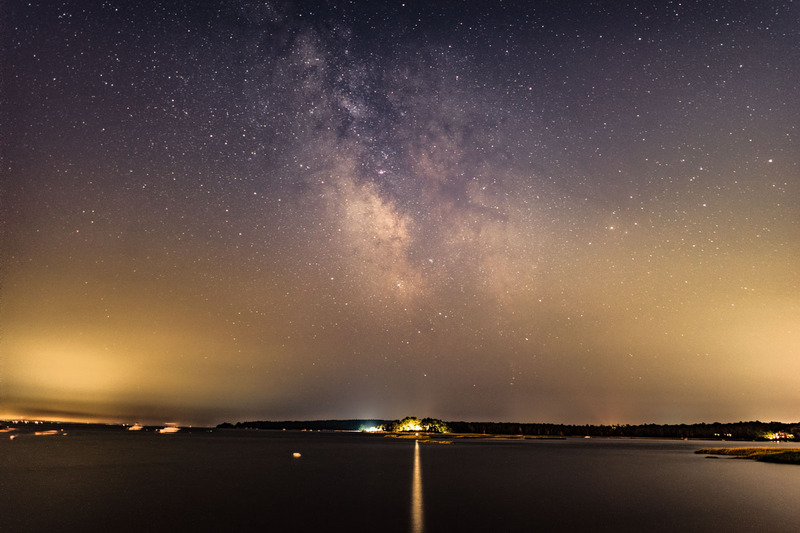 Most of these images are multi-frame noise reduction stacks (video tutorial) which allowed me to pull out more detail from the Milky Way in the light polluted conditions. Looking at the extreme corners, the stars show almost no distracting aberration, just like we predicted with our aberration test. There’s a tiny amount of star trailing from my 20 second long exposure but everything looks pretty good. Bravo Sony. Finally, I turned my camera upwards to capture the region of the summer triangle, Cygnus and the North American Nebula, capturing another 8 image stack of this dimmer region of the sky. I think the conversion lenses did an OK job. They, however, do tend to soften the extreme corners. The SEL057FEC fisheye conversion lens was the most extreme example of this issue, showing an ample amount of blurriness in the corners. While I feel that the conversion lenses handled astrophotography alright, and I welcome the extra field of view, the inconsistent loss of sharpness in the corners when used wide open seemed to make them immediately less desirable than just using the barebones FE 28mm f/2 lens. Blurry corners and a substantial weight increase are the biggest negatives of these conversion lenses. 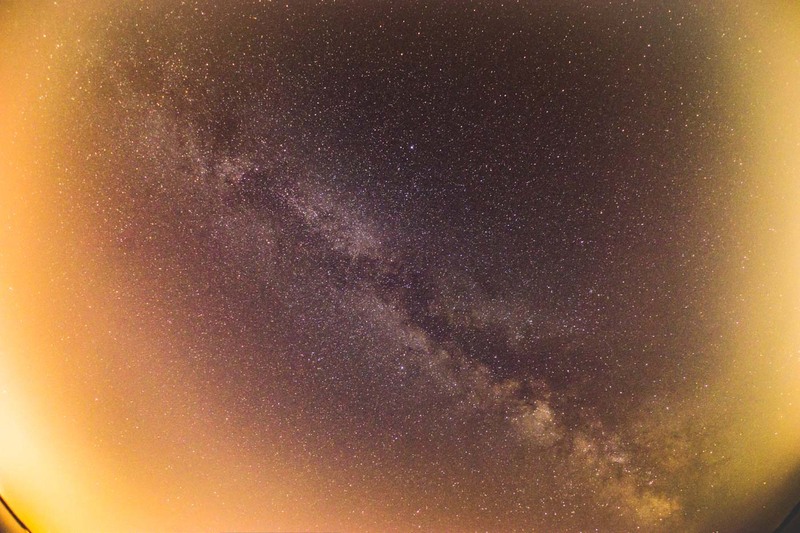 Finally, let me show you three images of the Milky Way in succession with the different conversion adapters applied. 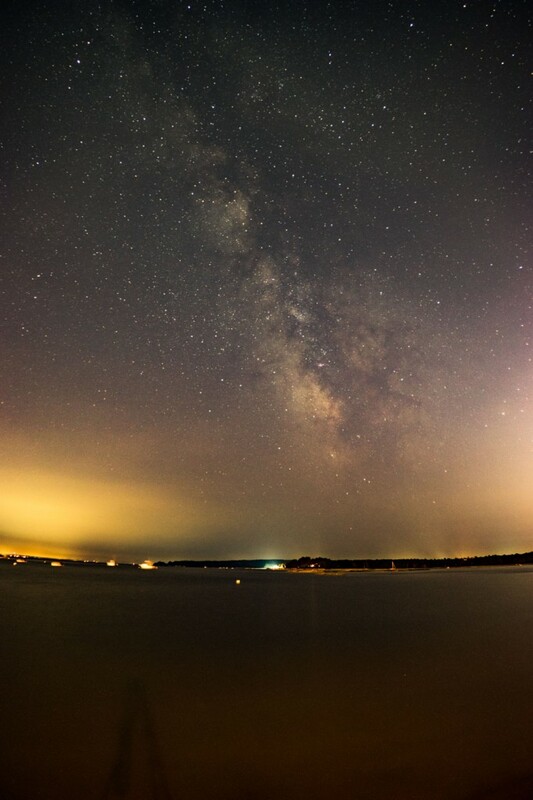 Notice that the SEL057FEC fisheye converter is so wide, the light pollution appears to create a reverse vignette and the horizon can be seen in the bottom corners of the image. Not a problem with the lens, just an indication of just how much light pollution I dealt with and how ridiculously wide the field of view of the SEL057FEC conversion lens really is. I really enjoyed using the Sony FE 28mm f/2 lens. Even in the poor conditions that I was constrained to for shooting, the bare lens performs very nicely for astrophotography. 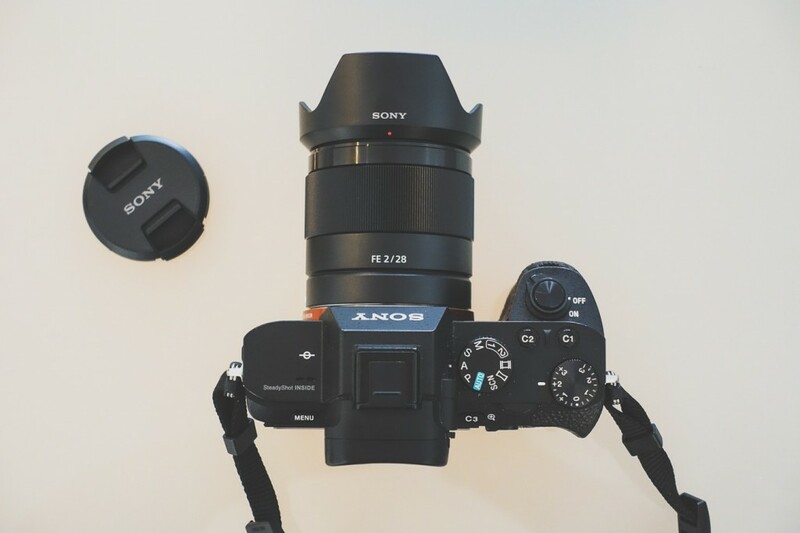 It’s not perfect but at its modest price and overall sharpness and aberration performance, it’s positioned as the most affordable and highest value lens for the Sony a7 series. All the traits of the lens tend to be very good: it’s sharp, has fast silent focusing, has nice build quality, everything you would want for the money. It performs very nicely for astrophotography, nearly matching the Rokinon 24mm f/1.4, one of our most well regarded lenses for wide angle landscape astrophotography. The major drawback of the Sony FE 28mm f/2 lens is its hefty levels of barrel distortion when shooting in RAW. The distortion is easily corrected in Adobe Lightroom CC with a simple lens profile but at the expense of a little resolution. The distortion is, in our opinion, the one thing that keeps this lens from being perfect. Other than that, it’s very, very good. The conversion lenses for the FE 28mm f/2 are more of a mixed bag. There’s no ability to use filters on either conversion lens. Both the SEL075UWC and the SEL057FEC show a noticeable problem with blurry corners wide-open, especially so on the SEL057FEC adapter. My personal major argument to make against the conversion lenses is actually not even their mildly reduced image quality in the extreme corners, it’s just the fact that they’re so heavy and awkward. Both conversion lenses weigh more than the FE 28mm f/2 alone. Cantilevering that much extra glass out on the front of the lens makes the camera feel remarkably imbalanced. The extra weight is perhaps not a problem when using the camera on a tripod but we all like using our gear for purposes other than just astrophotography and the conversion lenses are too bulky compared to other, higher quality alternatives. The conversion lenses feel like big compromises, a stop-gap that Sony devised to quickly fill the gaps in their ultra wide angle offerings for a7 series. They are a cheap way to add two ultra-wide fields of view to the kit, but I think the money would be better saved for a higher quality, dedicated lens. If you’re an a7 series owner, grab the Sony FE 28mm f/2, it’s great. Avoid those conversion lenses if you can help it. ISn’t this focus-by-wire? How the heck to you find and mark infinity focus on such a lens? I sold that rokinon because of the size and weight. Now having hard time choosing between 28 f2 and 35 f2.8. How would you compare them? How is this lens for panorama stitching? Is Lightroom effectively able to correct distortion / vignetting without artifacts? Hi Ian, I am absolutely intuitively bought this lens, already probably half a year can not go out at night to do something the sake of what I bought this lens. I use it with the A6000. Thank you for your review! Hi, I was just wondering if you’ve had the chance to test the 16-35mm f4 for astrophotography! I’m considering the 28mm as well but the 16-35mm suits my daily needs more although a criteria for my wide angle lens would be the ability to execute good astrophotography shots. Thanks!